In the world of digital photography there is a middle ground between a Point & Shoot and a digital single lens reflex. 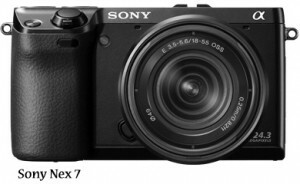 There is the new breed of mirrorless inter-changeable lens cameras, some of which can rival or surpass their larger competitors in terms of image resolution or continuous burst speed. Because of their smaller size, they can be the perfect cameras for travel without having to sacrifice quality or functionality. They can also be great cameras for the sports enthusiast allowing for ultra-fast frame rate capture, and all models offer HD video recording. Before getting into the advantages and disadvantages of mirrorless cameras, let’s look as some of the brands in this rapidly growing range of increasingly sophisticated cameras. A vastly improved auto focus system that, coupled with new STM, (stepper motor) lens technology, will deliver quick, accurate and constant auto focus. This means shooting HD video with Canon EOS lenses just became camcorder easy. 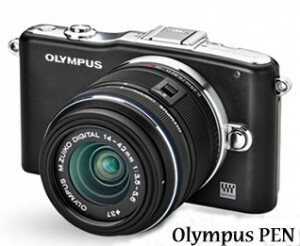 There are currently two new lenses, a 22mm STM “pancake” lens which offers the most compact package, and an 18-55mm STM. More are sure to follow. 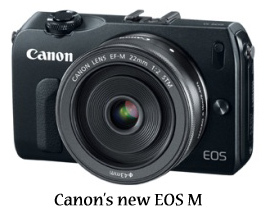 The new Canon Speedlight, the 90EX, has been designed specifically for the EOS-M. Using a mount adapter allows users to mount any Canon EF or EF-S lens offering endless possibilities. Sony has added two new versions to their already popular NEX series, the NEX-5n, and the NEX-7. While the 5n shares many similarities with its predecessors (simple touch screen interface, menu driven controls and very few buttons to get in the way of the casual shooter), the NEX-7 raises the bar significantly. Aimed at the more experienced photographer, it features a class leading 24.3 megapixel APS-C sized sensor, a burst mode of 10 frames per second, a built in, high quality electronic viewfinder, and dual function dials as well as a true mode dial. It also features a standard Sony hot shoe, allowing use of all existing Sony flashes, as opposed to the camera specific, lower power flashes that most mirrorless models offer. Nikon debuted their J1 and V1 mirrorless cameras last year and just today announced the J2. Stay tuned for more info on what that camera offers. Panasonic has a few new models as well, the Lumix GF-5, which offer user simple and intuitive control for both stills and video, as well as the higher end Lumix GX-1, which offers more advanced controls as well as an accessory shoe offering a variety of add-on options like a viewfinder, flashes, or a microphone. 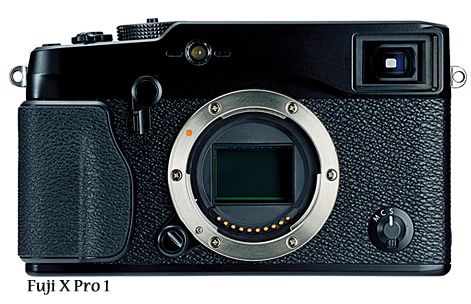 Fuji has also joined the mirrorless world with the introduction of their first mirror-less interchangeable lens camera, the Fuji X-Pro 1. This is aimed at the experienced enthusiast with features like a built in viewfinder, retro styling, dials for easy manual operation and a 16 megapixel APS-C size sensor. 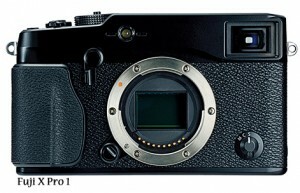 This camera uses Fuji’s new “X” mount and an adapter is already available to allow the use of Leica lenses, though Fuji will be expanding their own line of X series lenses. Mirrorless cameras are much smaller than other cameras that offer interchangeable lenses, letting the user carry high quality optics, HD video and much more in a small package. The lack of a mirror allows the lens to sit much closer to the image sensor. Lenses which would normally be much larger are now incredibly small and light while still retaining very high image quality.  Many models offer continuous shooting at up to (or over) 10 frames per second. This means very responsive auto-focus and the ability to track subjects - great for the amateur sports photographer or parents wanting to capture their energetic children. 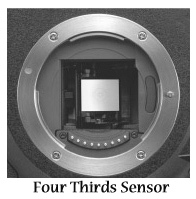 With the larger sensor size, some models match up with their larger, more expensive counterparts. The physical sensor size affects a variety of things, from levels of noise (graininess) at a given ISO setting, to the quality of a cropped or enlarged print and other factors. Less selection of available accessories. Flashes, microphones, remotes and release cables may be harder to get. There are fewer compatible lenses to choose from without spending more money on adapters to allow for the use of standardized lenses. Super Zoom lenses are far and few between and if you are able to find one for your camera, (Sony) the size advantage is gone. Who needs a tiny camera with a huge lens attached? It’s easier to hold a larger camera. The inherent problem with most mirrorless cameras is their lack of a viewfinder or the nature of the electronic viewfinders, which are inferior to the ones found on a DSLR. Instead of seeing what your lens is seeing as with a DSLR, you are essentially looking at a small LCD screen, which is never as sharp (or color accurate, or as focused) as a photographer’s eye. The bottom line here is that these cameras are perfect for some, while their very design may hinder the efforts of others. For many Point & Shoot users, the allure of a mirrorless camera is obvious. Better pictures, more control, but less weight and bulk than the larger DSLR camera and lenses. Others may prefer the feel and consistent performance of their DSLRs and the availability of quality lenses and accessories. But that is the great thing about technology; what’s perfect for one person, is not necessarily the case for the next person. It keeps technology growing and it keeps us photographers interested.